An attempt to answer the question of Changeability of the Scientific Mosaic which states "If an accepted theory is taken as the final truth, it will always remain accepted; no new theory on the subject can ever be accepted." 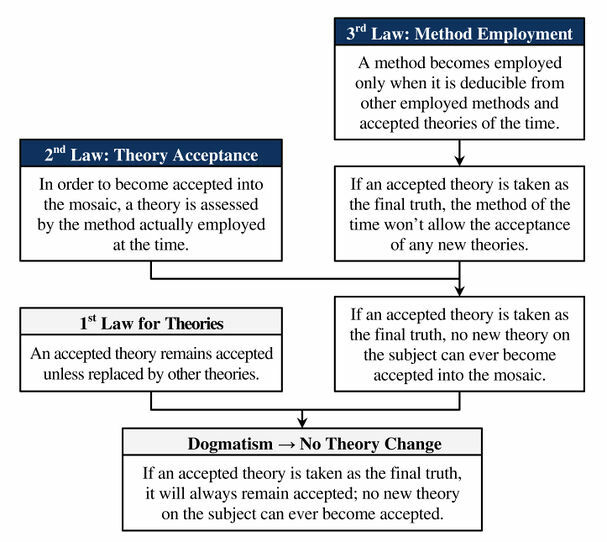 Dogmatism No Theory Change theorem was formulated by Hakob Barseghyan in 2015.1 It is currently accepted by Scientonomy community as the best available theory on the subject. Dogmatism No Theory Change theorem (Barseghyan-2015) is an attempt to answer the following question: Under what circumstances does scientific change become impossible? See Changeability of the Scientific Mosaic for more details. No theory acceptance may take place in a genuinely dogmatic community. Suppose a community has an accepted theory that asserts that it is the final and absolute truth. By the Third Law we deduce the method: accept no new theories ever. By the Second Law we deduce that no new theory can ever be accepted by the employed method of the time. By the First Law, we deduce that the accepted theory will remain the accepted theory forever1p. 165-167. This page was last modified on 6 December 2018, at 01:17.